World Tuna Day is an official United Nations observance instituted in 2016. It is observed on May 2. World Tuna Day is designed to raise awareness of the importance of sustainably managed tuna stocks. A tuna is a saltwater fish whose meat is known for its thickness and high protein content and is widely regarded as a delicacy in many areas. The largest species of tuna is the Atlantic bluefin tuna, it may exceed 2.5 meters in length and 450 kg in weight. Tuna is an important commercial fish, and over-fishing has reduced stocks of some tuna species close to the point of extinction. The active development of the tuna fishing industry began in the mid-20th century. 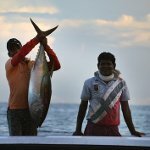 On the one hand, tuna resources are extremely important for many countries in terms of nutrition and food security, employment, economic development, government revenue, as well as recreation, culture and livelihoods. On the other hand, commercial fishing endangers some tuna species. Aquaculture is one of the ways out in this situation. Aquaculture, also known as aquafarming, is the farming of tuna which involves stocking, feeding, protection and other forms of intervention in the rearing process. One of the goals of World Tuna Day is to highlight the benefits of aquaculture and the social and economic benefits of sustainably managed fish stocks. It is also designed to disseminate information about the value of tuna and the dangers of uncontrolled commercial fishing.